Our New Multimedia Computer Lectern is worth another look in my opinion. 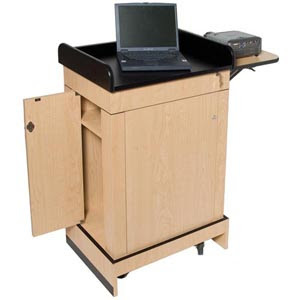 Having features like locking back and side doors, sliding top for laptop storage that locks as well, and 4 rolling casters that make this lectern glide easily makes me appreciate the ingenious engineering in this lectern. It feels so much more substantial than other lecterns, and rolls so easily on any surface that I have to give it an A+ for portability. With an area for Computer Desktop Tower storage, and locking doors you can easily access your equipment and keep it safe!